In this family, I’d be Crazy Cousin Julie. What happened in the tiger cage should have stayed in the tiger cage, but as ailsapm suggested in her blog post today, we could all use a little laughter in our lives about now. So, as humiliating as these pictures are, I am sharing them here with you in the hopes that it will give you a laugh or at least a smile. Approach the tigers from behind. Pet them firmly, not lightly. Do not ask staff to take pictures for you. They are there to monitor the animals and keep things safe. It all sounded reasonable to me. I acknowledged that I’d read the instructions and was let through two sets of cage doors where I found myself face-to-face with my first tiger. Another woman was petting him, but as soon as she finished, one of the young men lead me over to the tiger and directed me to approach him near his tail. He held out his hand for my camera and said he’d take my picture. It was completely opposite from the rules I’d just read, but I shrugged and handed over my camera. 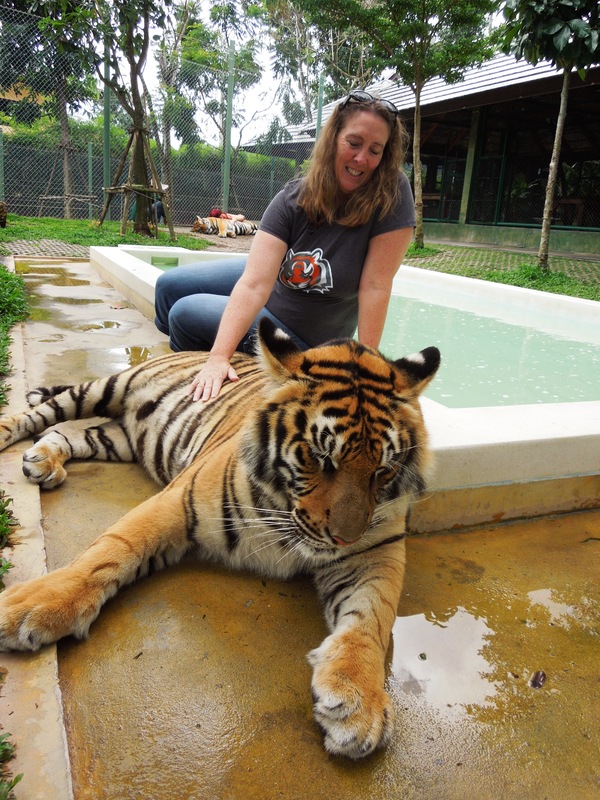 I gingerly crouched behind the first tiger and firmly petted him as instructed. His fur felt coarser and shorter than I’d imagined. I couldn’t believe I was doing this! I stroked my hand along his back and the trainer said he was only 16 months old. He was so big! Then the trainer took me to the next tiger and told me to lay down behind him. I moved over slightly and got a little closer to the ground. This seemed weird, but okay. 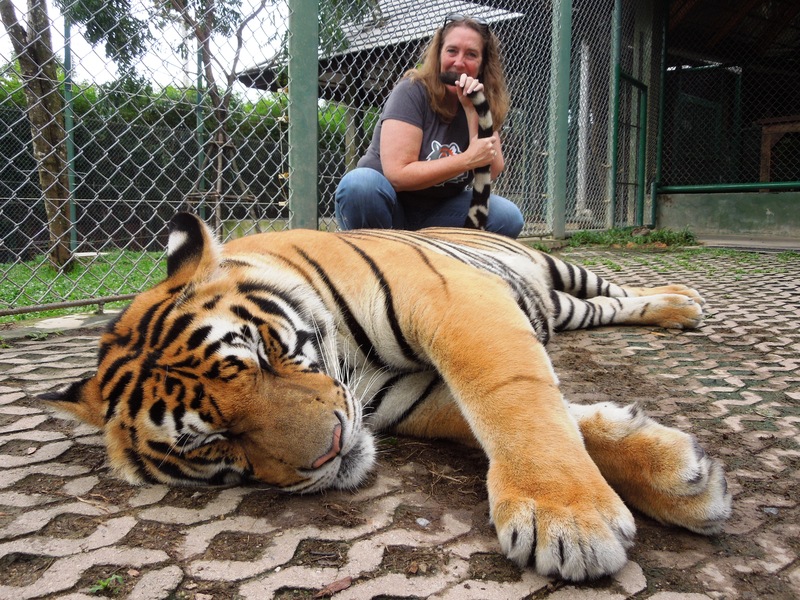 I lowered myself to the ground behind the tiger and petted him again. “Lay on tiger. Lay your head.” Like an idiot, I did. 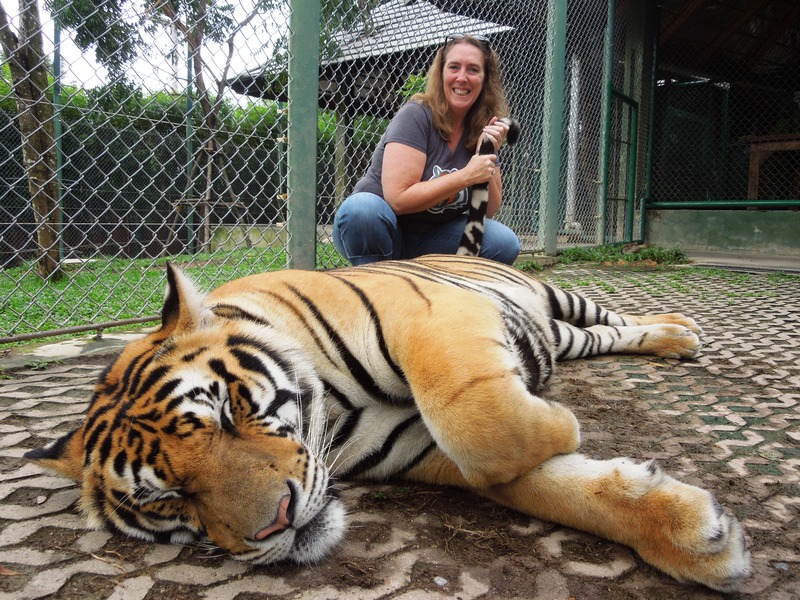 The trainer kept clicking away as he directed me to rest my chin on my hands on the tiger’s back. Then, as I rubbed his stomach. This seemed like I was pushing my luck. Against my better judgment, I did as he said AGAIN. My cats would have hissed and shredded me with their claws if I did it to them, but this tiger seemed okay with it. God help me, I pretended to bite the tiger’s tail as the trainer snapped away. I was starting to feel like I was more of a display than the tigers. We moved on to one of the females. I petted her and left her tail alone. 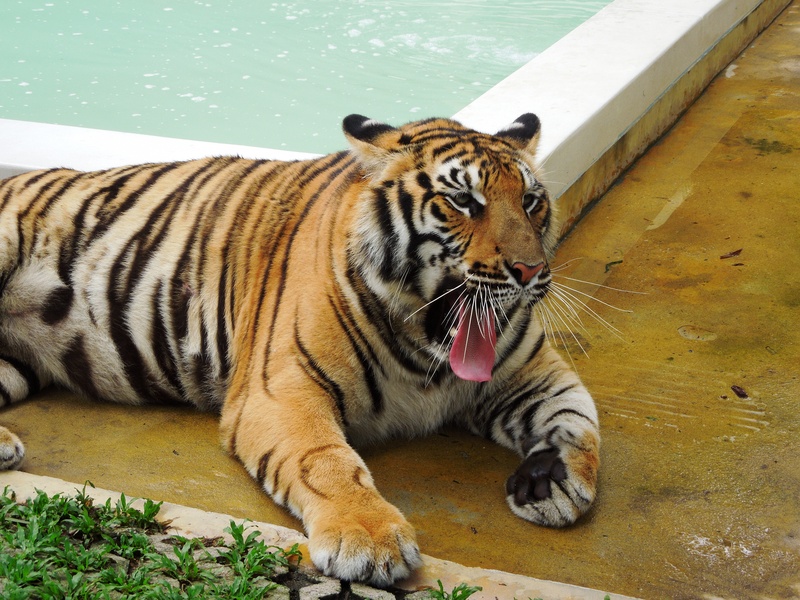 The last male was yawning and growling, but that didn’t stop me or the trainer from thinking that this was another good photo op. I complied and made a goofy attempt at tiger claws behind the back of this gorgeous tiger, but couldn’t stop laughing at the absurdity. It’s best the tiger had his back to me. I looked ridiculous and he surely would have turned around and bitten me if he’d seen how “fierce” the laughing hyena woman posing behind him was. My tiger encounter only lasted about 15 minutes, but it was the highlight of my trip. The whole thing was so absurd. I felt like I was in a Ben Stiller comedy. It was totally touristy and totally crazy. 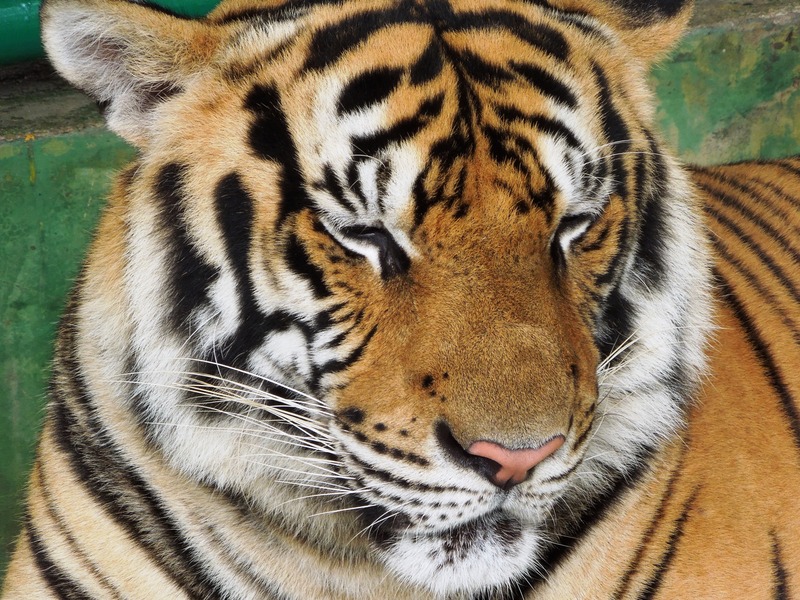 But that doesn’t change the facts: I petted tigers. I picked up their tails. I laid my head on one’s body. 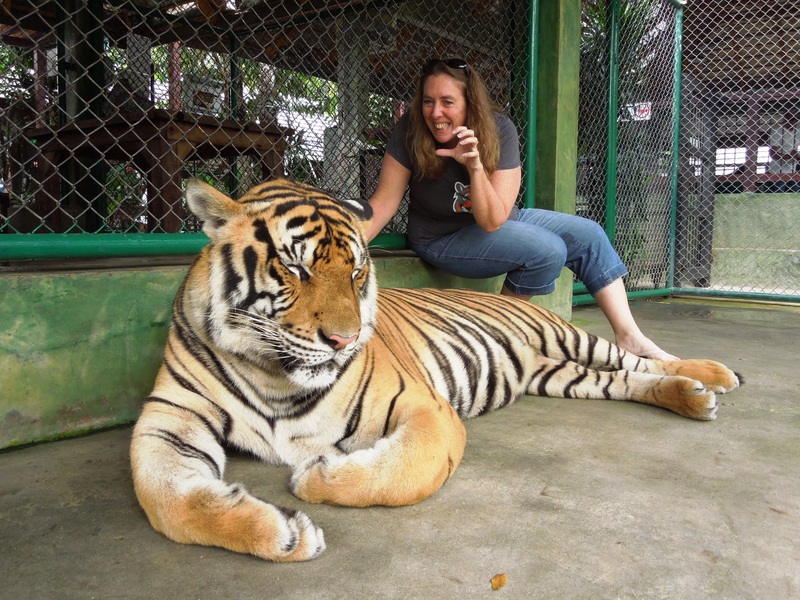 I touched tigers in Thailand! What animal would you pose with, given the chance? ← Phuket – I’m Riding an Elephant! Ha! Rest assured, I only pretended to bite the tiger’s tail. I do have a little bit of sense, though you can’t tell from these pictures. 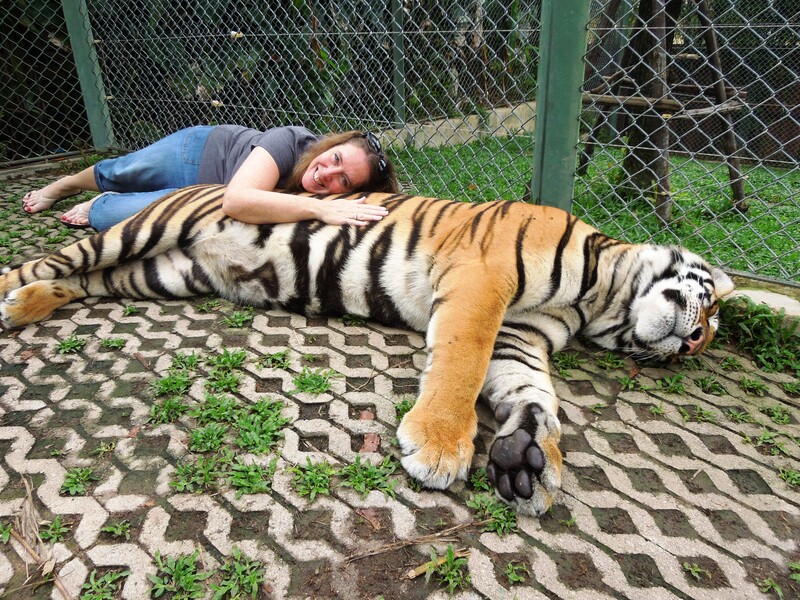 I am so jealous – how COOL is that – thanks for sharing and making my day with a good laugh too 🙂 I would love to be around big cats or even bears – just fascinate me, especially the paws – I know I am weird – ha! Big cats have always appealed to me. But I never dreamed I’d get to touch one. One can see in the last picture you realy scared the hell out of the tiger. Btw great stuff you posted! What incredibly beautiful animals they are and how lucky to be able to get so close to them. A most enjoyable post! Thanks! They are beautiful animals, indeed. You are braver than me! I have been to this place too – and there was no way I was going in there with them! I contented myself with patting some of the tiger cubs (the really small ones). Some of my friends went in, and I thought they were out of their minds. I just looked at my photos, and my friends look very awkward and nervous. You, on the other hand, look quite relaxed about it all. Well done!! I was probably slap happy. And so excited! I wish I’d gone in with the cubs, too. I’ll bet that was fun. I love this photos. Never heard of this place, but now I want to go there. Thanks for sharing these great photos! I hope you get to go there. It was such an incredible experience. Oh wow, brilliant Julie! You must be pleased now to have those pics. Well done you. Maybe if you’d been wide awake you’d have had more sense, but it worked out well. I have never had so many pictures of myself in my life. What a weird time to suddenly be the focus of a photo shoot! Oh MYYYY! Not only did you do this, you lived to tell the tail (I mean tale, tee hee), and have a great enough sense of humor that you ‘told’ on yourself with photos. Maybe the trainer really wanted to be a photographer? That tiger is real big! Oh my goodness ! What an awesome experience you had. A true thing to add to the bucket list. The cats looked as if they could care less. Probably was on Xanax or something like that. Thinking “Stupid tourist looking all dorky and stuff.” Yeah..big cat thoughts. Great post and incredible thing to do. Holy cow! Or, should I say holy tiger? You’re getting a Standing O from me. That’s one big kitty. I wouldn’t step foot in there. Bravo! It wasn’t even on a checklist! I can never think of things like this to add. I’m a horrible list-maker, but for those that do make lists, I’d definitely add this. YOU ARE CRAZY COUSIN JULIE ! ! ! BUT, BRAVE CRAZY COUSIN JULIE !! That looks like so much fun. I remember they did that in the first season of The Amazing Race and I remember wanting to try that, so much. Interesting. Ironically, I can’t watch that show because I get wanderlust too bad afterward. Nutty, I know. Most people think I would love it. What a phenomenal experience! I’m impressed. Looks scary, but totally amazing! Did they mention as to how they’ve actually been able to tame/train these tigers so well? No, they didn’t elaborate. Just that the tiger cubs are brought up there. I keep thinking the smaller cubs (shouldn’t they be called kittens?) would have been more dangerous — kinda like puppies who always want to play but don’t know their own strength.